The real swing kids - hepcats in Hamburg. Swing kids, known as swingjugend were the antithesis to the Hitlerjugend or “Hitler youth.” They loved British and American culture, clothing, and the music. They wore their hair long, sported the Union Jack on their trench coats, carried umbrellas, and gals left their hair long instead of pinning it back in the traditional German rolls. And they really were just kids. Most of the people involved in the Swing Kids movement were between the ages of 14 and 18. 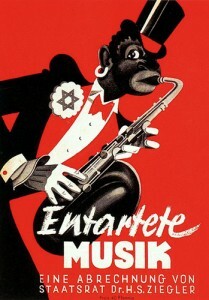 This Nazi propaganda poster against swing music that says "Degenerate Music: by order of the state Dr. H.S. Ziegler. The swing movement struck a chord with the disaffected youth of Hamburg and Berlin who were unhappy with the policiesthat were advocated by National Socialism. The Hitler youth, rather than trying to attract more followers with swing music and jazz, encouraged the young people to participate in German folk dancing rather than listen to “that damned jazz.” For these swing boys and swing girls, being a Swing Kid was a form of non-violent protest against National Socialism. Their dress and their music was seen as a direct affront to the Nazi ideals, and their dress, music and dancing was considered “overtly sexual” and “immoral,” so they often made fun of the Nazi slogans and co-opted the national socialism terms for their own. Yes, they really did say “swing hiel!” as play on the traditional salute to Hitler and it became the rallying cry of the Swing Kids. As the swing movement grew in Germany, so did the number of laws that were passed in an attempt to limit the growth of the swing movement as it was assumed that they were all a part of the resistance. While some members did have resistance ties, most of them were apolitical and weren’t consciously resisting Nazism. In 1941 the Third Reich passed the law that it was illegal for anyone 21 and under to enter a dance club, so it was necessary for the Swing Kids to make their get-togethers as clandestine – and to look as “Geraman” – as possible. Some of the Swing Kids were forced to join the Hitler Youth as part of the Nazis’ tamer measures to curb their involvement, but rather than be a direct deterrent it just forced the swing movement underground. 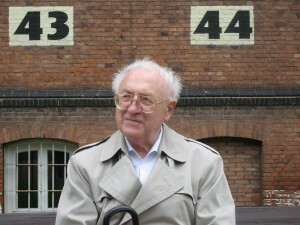 Günter Discher was a Swing Kid leader and survived imprisonment in a concentration camp. 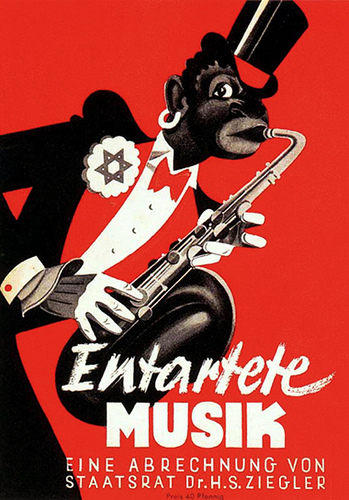 Unfortunately while they thought their swing and jazz clubs were clandestine, the Nazis had already worked to infiltrate the group. 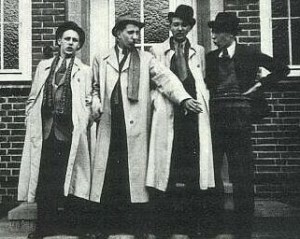 On August 8, 1941 the SS conducted a raid and arrested over 300 of the Swingjugend. Punishments at the moderate scale were to have your hair cut and to be sent back to school where former Swing Kids were closely monitored for any signs of future subversive activity or rebellion. The prominent leaders, or those who had been in trouble before, were immediately deported to concentration camps. In January 1943 Günter Discher, one of the ringleaders of the Swing Kids, was arrested and sent to Moringen, a youth concentration camp. Discher miraculously survived and is now Germany’s oldest living swing and jazz DJ. His music collection is astounding – it’s reported that he has 25,000 LPs and over 10,000 CDs. He released some amazing swing compilations on his website, including rare recordings from swing-era Germany. His website is all in German, but you can check it out here. The Swing Kids may have been apolitical, but their actions certainly made a political statement. Their voices, beliefs, and love of good music and good fashion was enough to frighten the Nazi machine. Let’s make sure that swing music never dies. I found this article while researching for a post of my own on Swing Kids, and you’ve done a great job here. Fantastic film.